This is especially a favorite in the summer with freshly picked vine ripened tomatoes. However, anytime of year you can still try to recreate this summer bliss by finding the ripest, freshest tomatoes available. 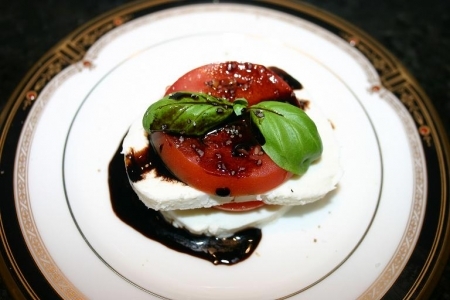 Fresh mozzarella is a must as well as fresh basil. Spicewood Food Company balsamic vinegar aged 18 years is being used and can be ordered on-line at Spicewood Food Company. The reason for using this vinegar is that it is like a reduction a tad bit sweet and very smooth! Yield will depend on how thick you cut the tomatoes and the fresh mozzarella. Yields about 6 and 8 towers. Slice tomatoes and fresh mozzarella. Portion out 2 of each for each serving. Do not chiffonade basil until ready to serve, but portion the correct amount for each tower. If you have 6 servings, portion out 6 sprigs of basil for garnish, chiffonade the rest to use inside the layers of the tower. Again, do not chiffonade until ready to assemble. If you have 8 servings, portion out 8 sprigs for garnish, Chiffonade the rest to use inside the layers of the tower. Again, do not chiffonade until ready to assemble. At this point chiffonade the basil. Assemble towers by placing a slice of mozzarella on the plate, a tomato slice, a chiffonade of basil, a mozzarella slice and then a tomato slice. Pour about a tablespoon of the aged balsamic vinegar over each tower. Top with a basil sprig and sprinkle with a dash of kosher salt and freshly cracked pepper. Try Veneto Pinot Grigio, Wente Vineyards Riva Ranch Chardonnay (Livermore Valley), Hahn Estates Chardonnay (Monterey) or Franciscan Chardonnay (Napa Valley, California).